This moth gave me a lot of work looking for her identification. Comparing the few images on the web, it could be an Acropteris illiturata, but it has never been reported in Madagascar. In this country there are only two reports of this family, Acropteris insticta and Acropteris vacuata. They are identificated by Warren in 1897, so very old and of which there are no photographs on the web. However, I favor the "illiturata" subspecies, the design of the wings is practically identical, in this case it would be the first time since Madagascar. Questa falena mi ha dato molto lavoro alla ricerca della sua identificazione. Confrontando le poche immagini presenti sul web, potrebebe trattarsi di una Acropteris illiturata, che però non è mai stata segnalata in Madagascar. In questa nazione si registrano solo due segnalazioni di questa famiglia, Acropteris insticta e Acropteris vacuata. Sono identificazioni fatte da Warren nel 1897, per cui molto vecchie e di cui non ci sono fotografie sul web. Comunque propendo per la sottospecie "illiturata", il disegno delle ali è praticamente identico, in questo caso sarebbe la prima volta dal Madagascar. Lovely moth specie. Nice wings and colors too. My fingers tinkling to set the LEVEL, very interesting contrast shot and here the camera setting by spot metering could help more. It is indeed a unique species, Luciano. 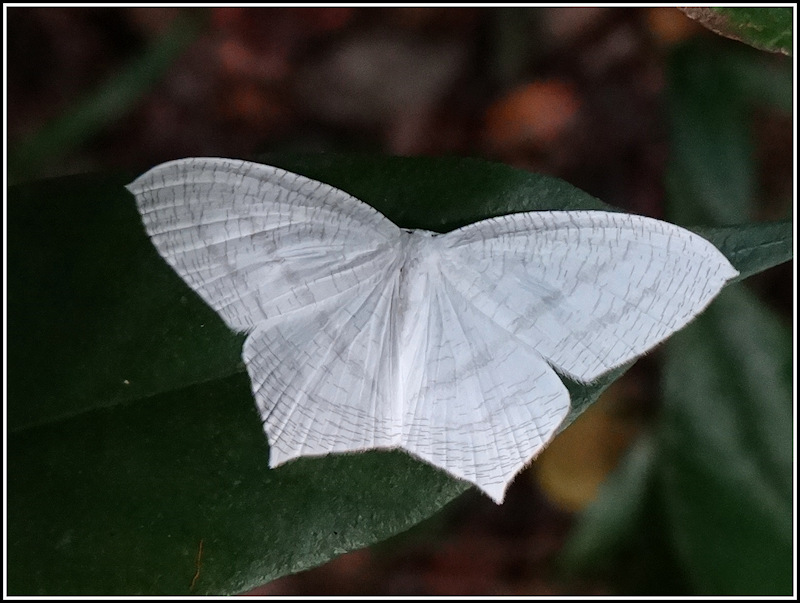 The image is marvellous with perfect white balance and clear intricate pattern on the wings. Very nice picture Luciano of this Acropteris. I like its white color contrasting with the background! Very good shot of this beauty moth. Fantastic photo in great sharpness and a beautiful white balance. Nice contrast against the dark background. La feuille aide au cadarge de l'insecte. La prise de vue permet de voir les détails du papillon Acropteris cfr.illiturata. La lumière fait ressortir la beauté des couleurs. Bonne journée. This moth is different to others in regard of color. Being white the exposure is balanced, as well the details.